While the Western beauty industry has battled against the recession with relative success, I’ve been hearing about an increasing number of beauty companies that are starting to eye up other, emerging markets - namely BRIC: Brazil, Russia, India and China. So, why Brazil, Russia, India and China? Because these countries have experienced phenomenal rates of economic growth and consumer spending power, which in turn offers huge potential for beauty companies who focus their efforts on these markets. And this potential can be backed up with figures, with market research company Euromonitor revealing that these four countries will contribute over half of the total $43billion absolute growth in the global beauty industry by 2014. Ignore that at your peril! The Brazilian market is set to become the 3rd biggest beauty market in the world, according to The Beauty Economy report published in The Times in May 2011. Research company RNCOS’ report, Cosmetic and Personal Care Market in Brazil, puts this down to a changing lifestyle and rising consumer awareness, with people becoming more beauty conscious with increasing disposable income and product availability. India’s cosmetics market is growing at an annual rate of 15-20 per cent, which is twice as fast as that of the US and European market, according to national Indian news service IBN Live. The International Trade Administration says that the emergence in India of a young urban elite population with increasing disposable income in cities, including an increase in the number of working women looking for lifestyle-oriented and luxury products, is the main driver of demand for imported cosmetics products. Indian consumers tend to look towards international brands as lifestyle enhancement products. Considering make up wasn’t even allowed in China until 1982, its annual retail sales in beauty and personal care is now worth $20.8billion, reports The Beauty Economy. But it also points out that there is still a lot of education needed and this will be the first job of cosmetics companies. In recognizing the market’s potential, Estee Lauder opened a research centre this year in Shanghai, to create products tailored to the needs of Chinese and Asian skin types. BRIC consumers V. Western consumers – don’t treat them the same! Beauty consumers in the BRIC countries are very different to Westerners, and so the key to brand success will rely on their ability and efforts to thoroughly research the different consumers and dynamics in each market, plus any regional differences. As well as the large multi-nationals such as Nivea, Estee Lauder and L’Oreal (which uses Geocosmetic research techniques to understand different beauty needs by monitoring people’s beauty regimes in different countries), independent beauty brands are also reaching out to the BRIC markets. One brand making a particular splash is L’Occitane, which recently told chinadaily.com that it has opened 60 new stores within a year in the BRIC countries. 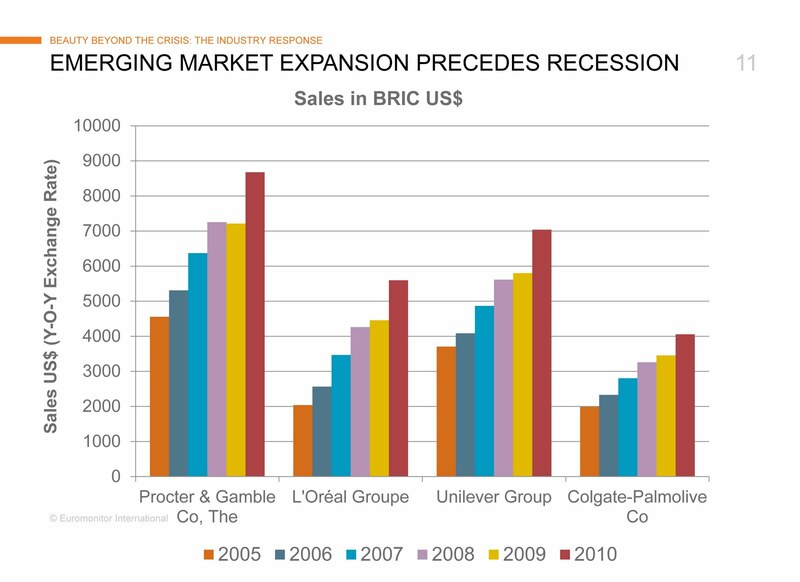 Presenting at beauty trade show In Cosmetics 2011, Euromonitor said that emerging market value sales in 2010 were $166billion, compared to $216billion in developed markets. Something tells me that the gap between these figures will only reduce further in the coming years.